An Ad for the Sodus Point Hotel from the Sodus Point, NY Year ‘Round Vacation Wonderland (Page 2) put out by the Sodus Point Chamber of Commerce circa 1950s. 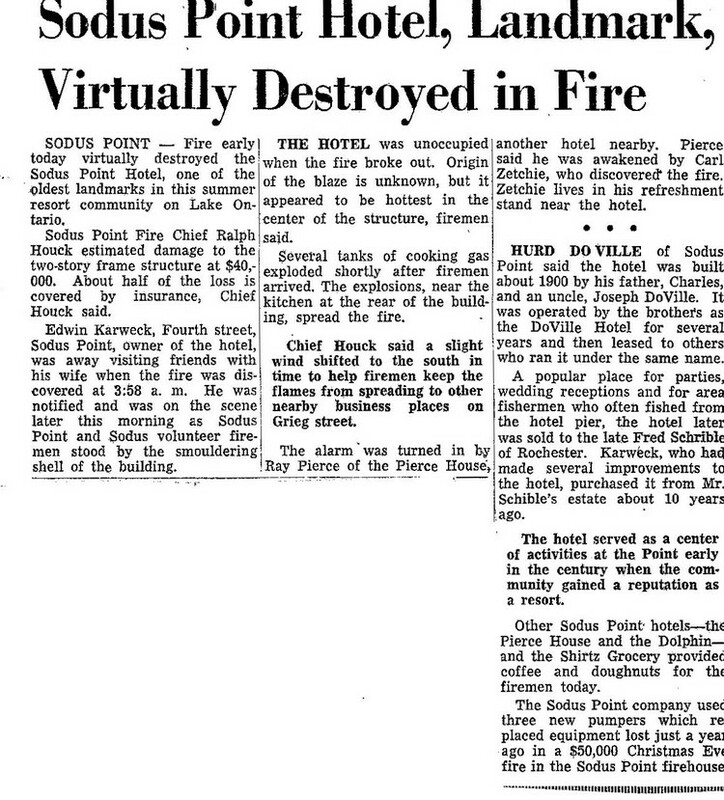 Thanks to Stuart Balch and Mark Jones Sr. for sharing this newspaper article on the December 27th, 1954 Sodus Point Hotel Fire. The Sodus Point Hotel (formerly known as the Cottage Hotel) was built in 1900 by Charles DoVille and later operated by Fred Schaible. Edwin Karweck owned the hotel at the time of the fire. Frank Grosz also had added another part of the story not mentioned in the article: After the fire started, Tom Vandee went up to the second floor to rescue the large amount of whiskey stored there. He was throwing the bottles of whiskey to a young Frank Grosz on the street below expecting it would be stored across the street. Frank tells how him and another youth stored some of the whiskey under the roller skating rink for later underage drinking. Sodus Point has always had its priorities set correctly: Women and booze first! 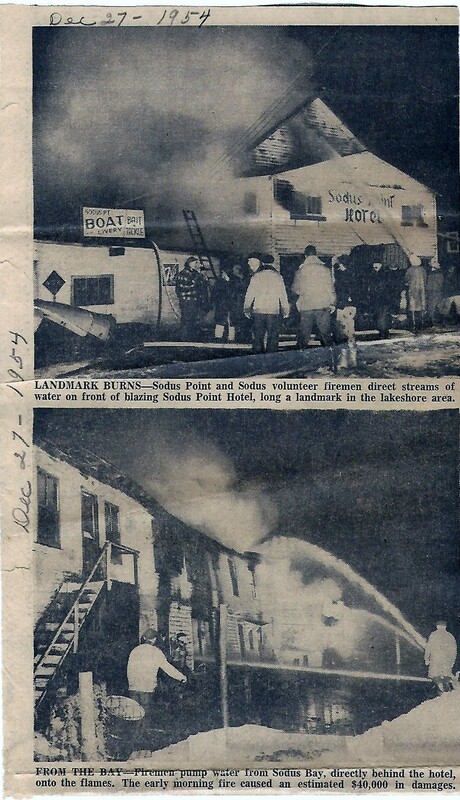 The Sodus Point Hotel was located where the current Marlin’s restaurant is now located. The Hotel was built out over the water and one of the unusual features of this hotel was a trapdoor on the floor that when opened would allow for fishing! As previously mentioned, the property was formerly known as the Cottage Hotel and was built in 1900 by Charles DoVille. 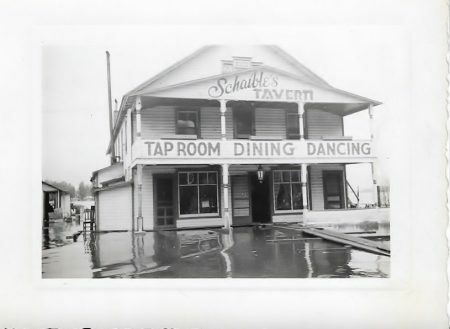 Later in the 1940’s it was operated by Fred Schaible as Schaible’s Tavern. 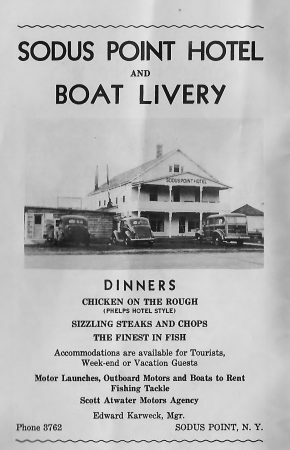 Schaible’s Tavern in the 40’s was owned by my Aunt Marge’s (Schaible) parents and eventually became the Sodus Point Hotel. (My guess is when Ed Karweck bought it). We think it burned in the late 40’s or early 50’s (Editor’s note: it was 1954. See article above) and then was replaced by what became Karwecks which was a single story bar and restaurant. Ed Karweck owned and/or operated the Sodus Point Hotel. This property would go through a number of iterations and owners over the years The latest being Abe’s restaurant followed by Marlins (2019).